I’ve just now returned from the most brutal and challenging hunt of my life, and thought that I’d take a moment to write you this letter while the experience is still fresh in my mind. As you know, the weather here in the Midwest has been balmy. Just last week I was splitting firewood in my shirtsleeves! That’s all well and good… as long as you’re not a duck hunter; the hunting has been tough. A few days ago that all changed. A lot of weather blew in, and with it, the long awaited flights of northern ducks and geese. With just one day left in the late goose season, I had to go. It was big weather, the kind of cold and blowing snow that brings birds, discourages other hunters, and makes you wonder if you’ll ever make it home. The wind was blowing so hard that I couldn’t track the canoe by polling. When I decided to lower my profile and paddle, the wind simply laughed at my efforts and blew me into shore. I had to drag the canoe behind me into the marsh until I thought that I’d never take another step. All of this, for the chance to shoot a goose… just one, that’s the limit on my marsh. As a matter of fact, I did shoot my bird. A small flock of large geese came out of the swirling snow and decoyed perfectly. I listened to a small voice from my past, and picked out one bird; one that I judged to be a young bird of the year. I stood at just the right moment, and they flared as if in a Lassel Ripley etching. It was an easy shot, the kind I sometimes make, and my bird came down in a crash of snow and ice. It was a clean kill, and as I collected it from the decoys, my mouth watered with thoughts of the wonderful things that Lisa might do to it for our Christmas dinner. My revelry was short lived, however. 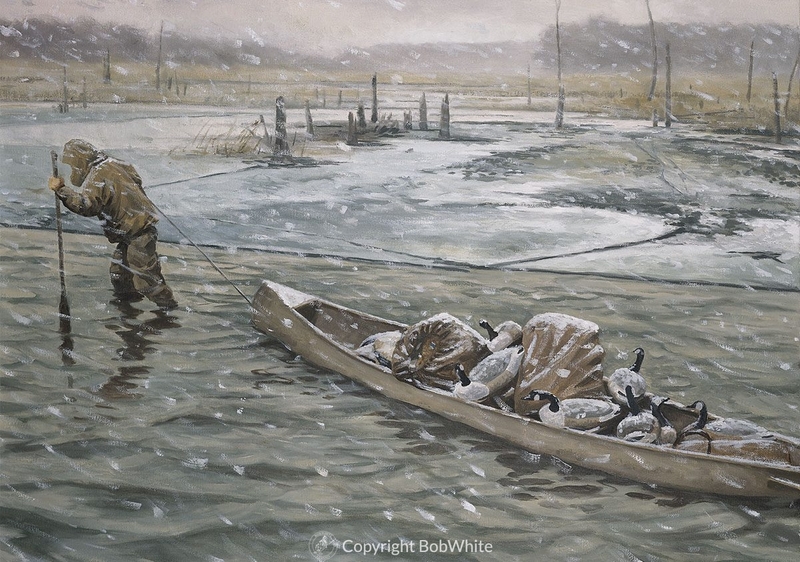 My hands froze while I picked up the decoys, and I barely survived the ensuing trudge across the marsh that found me dragging a canoe that gained weight with each additional snowflake. I swear… I could feel every added snowflake! I lowered my head into the storm, to keep my hood from being blown back, and pulled on the bowline for what seemed like hours. Finally, I found myself on the big river, in the dark, where I’d have to navigate a couple of miles upstream to town, the Brookside Tavern, and eventually home. Then, the storm really started to blow. My God, did it blow… and all downstream! No matter how quickly I paddled, the canoe would weathervane between each stroke. There was no other way; I gave up and paddled backwards against the current and a blizzard of needle sharp snow. It was slow going and even the thought of that golden Christmas goose could not fortify me for what I knew would be a soul crushing truth should I dare look to shore, and so measure my meager progress. No, I dare not look. I lowered my head and did what needed to be done; I paddled. I paddled until my arms ached from the unfamiliar strain of pushing a canoe backwards. I paddled in a trance. And, in my stupor I remembered that day in Alaska when we snuck up on several hundred Aleutian geese. I relived the moment when we peered over the storm berm, and saw all of them there, cackling and feeding in the eelgrass. I recall how we giggled at each other as we slipped out of our hunting coats, and then stood, neither of us knowing what it might be like to be among so many geese. It was deafening! I don’t remember shooting, only the realization that my shotgun was suddenly empty, and that my father would not have been pleased with my flock shooting. I don’t remember your shots either… only the look on your face as the smoke cleared and all of those geese flew away. It was the look on your face as you shook your head in disbelief that made me laugh out loud as I struggled into the stormy night. I was still laughing when the canoe nudged the shore. Some hunts are easier than others, but our memories, altered by time, have a way of making them all end well.